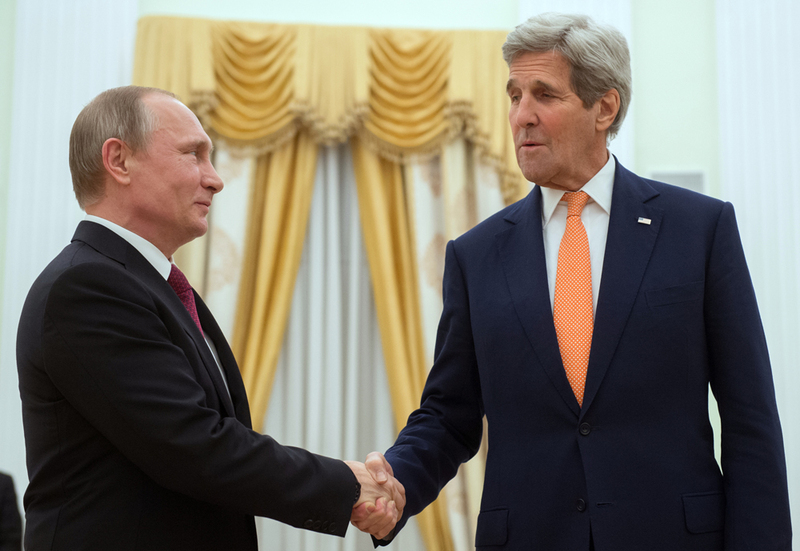 Russian President Vladimir Putin and U.S. Secretary of State John Kerry, March 24, 2016. Russian President Vladimir Putin asked U.S. Secretary of State John Kerry about the contents of his briefcase at a meeting on March 24 at the Kremlin. At the beginning of their meeting, Putin noted that the U.S. diplomatic chief carried his personal effects from the plane and suggested that he may have brought in cash to bargain with Russia. Putin stated that Kerry is always welcome in Moscow because his visits offer chances of advancing matters on serious issues. "We are always glad to see you," Putin said. The U.S. Secretary of State is in Moscow to hold bilateral talks with Russia on Ukraine and Syria.